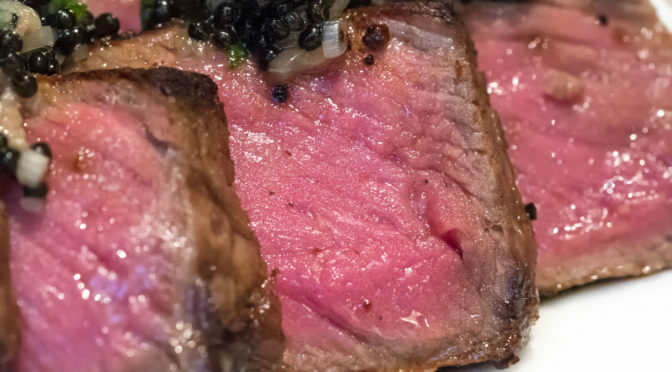 This page is where you’ll find a collection of my restaurant and steakhouse reviews in which I awarded a full 10/10 points in the flavor department for whatever steak I happened to devour. These joints served up cuts of beef that were so damn good that I designed an award banner to give them! However while they may have served up the most flavorful meats, that doesn’t mean they’re necessarily my favorite places to get a steak. To illustrate what I mean, let’s use an example. Let’s take a trip to the theater district, shall we? Gallagher’s steaks scored nine for flavor, but I’d go back there any day of the week over another trip to, say, E & E Grill House, for various non-flavor-related reasons. In total, Gallagher’s scores 95/100, while E & E scores 89/100.